Fossil Sunshine is one of those innovative and fruitful encounters between science and art. Having completed a course in creative writing at Warwick University and worked as an International Writing Fellow at University of Iowa (gaining much literary recognition along the way), Michael McKimm is now a valuable member of the Geological Society of London’s Library having set up the Written in the Rocks Project in 2012. This improbable endeavour originated in their “Poetry and Geology: a Celebration” conference. President of the Society, Bryan Lovell, voiced a peculiar challenge: “I hope that our poetry will help to establish true environmental conviction where our scientific prose has failed us.” McKimm spent a year exploring and investigating various landscapes, rock formations and geological literature as well as attending conferences UK-wide – all the while surrounded by expert scientists. Finally, he carved the observations he gathered along the way into poetry. A key aspect of McKimm’s work is his concern with the “Anthropocene”, a new term coined by scientists to describe the geological era where humans and their activity directly shape and alter the climate. The title of his collection, Fossil Sunshine, is already evocative, a perspective-inducing play on words. Fuel is a symbol of man-powered technologies, relentlessly functioning in order to sustain the frenzied pace of modern society brought on by the Industrial Revolution, an event still less than 200 years old. 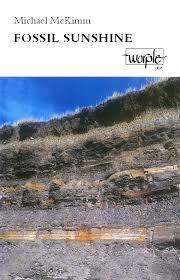 The title suggests the millions of years and natural processes required to form the said fossils. The poem “Pipeline” is another example of man’s impact: McKimm follows the trajectory of a pipe and records how it affects its surroundings. The trickling and sometimes unintended effects in the natural, social and economic spheres demonstrate how one particle or process cannot be separated from its agency in the whole. Throughout, scientific veracity is preserved, but “translated” in such a way that invite a wider audience to engage with unequivocal environmental realities. Furthermore, McKimm’s poetry is varied and injects life into the seemingly inanimate substance of rocks. He proves that imagination is far from exclusive to artists. “Abstract from a Conference: Plenary” sees scientists looking for solutions to climate change: “we might want to start a nuclear winter”. Interestingly, upon returning to his native Ireland after the project’s completion and gazing upon the Giant’s Causeway, that ever-present rock formation in County Antrim took on a new significance. Through these poems we can easily share that feeling, and gain a fresh perspective on our endangered environment. Why should we really be surprised? After all, Galileo’s research was also presented in verse.